This mascara is decent. It has great packaging that is fun but still high end looking. It does flake a little, but it really isn't much, and it's a few hours before any flaking occurs. It adds a lot of length which is build able. The biggest downside is I feel that the "volume" it gives is clumpy and makes your lashes look spidery. I am pretty bummed to be having to do this review, but it has been requested a ton. So I am doing it. First of all the packaging is awesome. It is cute, professional, high end, but still fun. The mascara stays put fairly well. I have not had any flaking issues with it. You do have to put on several coats before seeing a difference, so it got a lower longevity score. There is no volume in this mascara, like at all. However you get an average amount of length form it. 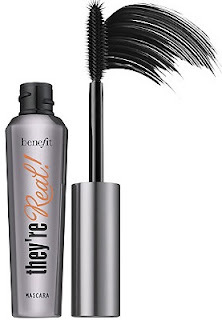 So here is the deal with this mascara. It came out, everyone was so excited, and I bought it. I fell in love. I wore it every day for about 3 weeks. What I learned in that three weeks was interesting. This mascara is supposed to curl your lashes without a lash curler. I do feel like it does that well. However you get these super long, separated, volume-less lashes that look clumpy and fake. It's weird how there can be a ton of separation and clump at the same time. I became disillusioned quickly. Have you seen the latest celeb collaboration in the works? Recently celebrities have been teaming up with big name beauty brands to create beautiful packaging, new shades and limited time only palettes that people go crazy over! I mean have you seen Gwen Stefanie's Urban Decay Collection? And let's not forget about Instagram's very own Vegas Nay and her collaboration with Too Faced, as well as Eyelure! Also with Eyelure not to long ago? Katy Perry. As you can see these collaborations are common and fun! 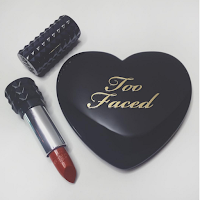 Well Kat Von D has been teasing fans with the illusion to an upcoming collaboration with Too Faced! I was surprised ot hear the news honestly. I mean Gwen Stefani, nor Vegas Nay have their own cosmetics line, where Kat Von D does (currently at Sephora and online exclusively). However these two insta posts pretty much prove it's coming! One shows Von D with the CEO of Too Faced (and some secret stuff blurred out on the table between them) and then a sneak peak of what is to come!!! So here are my questions! When is it coming!? Hopefully soon, with all the not so subtle hint dropping! WHERE!? I am sure it will be online, and also in Sephora. However truth be told I am not a Sephora fan. Ulta is more my speed because it has a wider selection of cosmetics, skin care and hair care, as well as sales and a great rewards program. But while Ulta carries Too Faced it does not have Kat Von D, so will it have the collaboration? I HOPE SO! In a word, yes! 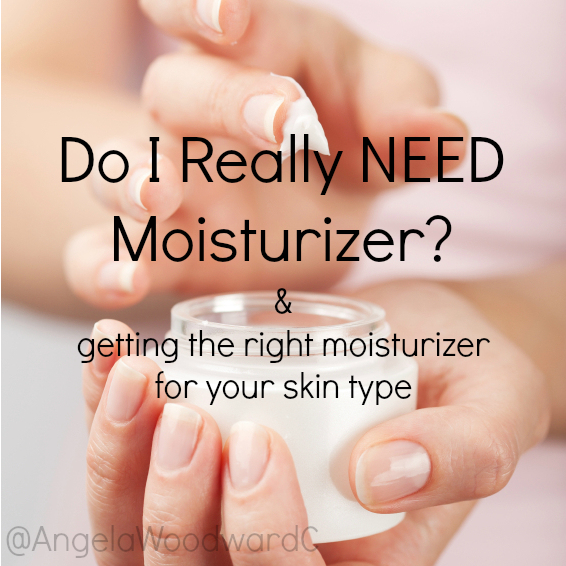 It is as simple as that, you do NEED moisturizer. "But Angela" you say, "what if I have oily skin?" Well then, you DO need moisturizer! We all do. The reason is because moisturizer delivers Irishmen to our skin to keep it healthy and hydrated. You may find that after using a good moisturizer you will have less oily skin as well. So here are my favorite mositurizers for differnt skin types! This means your skin is not oily, not dry and not sensitive. You skin is normal. 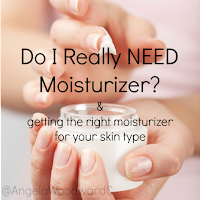 You need a simple moisturizer that will do the job. You can really use anything, but my favorite for normal skin types is the Philosophy Renewed Hope In A Jar. 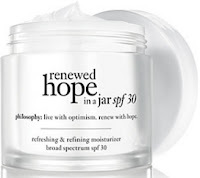 This is because this moisturizer will replenish skin without leaving it feeling heavy or coated, and it gets the job done. A little goes a long way so it is a good value too. If your skin is sensitive you need only the purest and simplest ingredients in your products. This is why I recommend either Soak It Up by Pur Minerals or Mineral Moisture Complex by Pur Minerals. Soak it up is best for drier skin types, which Mineral Moisture Complex is great for oily or normal skin types. Both are made by Pur Minerals and have simple and hard working ingredients that will work, without irritating your skin. This is me people! Dry skin gets flaky and sometimes even scaly where your skin needs moisture most! I highly recommend the Skin Smoothing Cream from Dermalogica for this! It is intense, creamy and you will feel it working right away! After just a few days of use there is no more flaky foundation or scaly patches! It is worth the investment for sure! 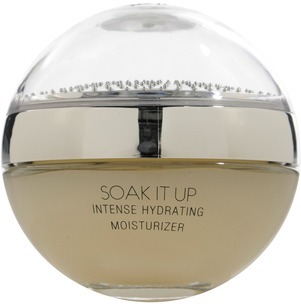 As mentioned in the Sensitive Skin section, Soak It Up by Pur Minerals is also a good option. If you have oily skin, you know it! Oily skin types are the most prone to break outs and often liquid foundation just doesn't stay on your face. For oily skin Active Moist from Dermalogica is my go to, because it is lightweight and works, but is also quickly absorbed by the skin. I am super happy with this kit overall! First I will start with packaging, which I love. I love the way Lorac packages their Pro series. Most palettes either have a hard metal/plastic case or a very fragile cardboard-like case. Lorac's Pro series has cases that are soft and gripped, lined with a sued-like material. They are awesome and they help absorb shock so your makeup is less likely to break when dropped. Plus it looks professional, expensive and high end. I love the pigmentation on this palette. 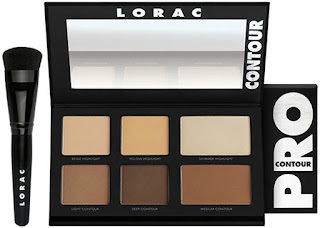 When you have eye shadow you want the colors to be as rich and pigmented as possible, but with contour there has to be a balance between enough pigment that a little goes a long way and not so much that you end up with a dark streaky mess. This palette has the perfect balance! Plus the shimmer highlighter is the best powder one I have tried in a long time! It wasn't glittery. It had just enough shimmer to catch the light without making you look like you are covered in pixie dust (perfect for strobbing)! I felt the colors were very versatile. I was surprised by how dark the darkest shade was, it was a little dark for me personally, however I still feel like I am going to use it, especially on special occasions where I put a lot of time into my look. I really feel like I will use all the colors often, however I feel it wont work well for people with really dark or ebony skin tones. The full kit comes with the palette and the brush, as well as a very informative and easy to follow contour how-to guide. The brush is okay. It is kind of dense, so for people who are beginners or who like a softer look this brush is a little tricky to work with. But if you like a dramatic look and know what you are doing it will probably work great for you. The biggest thing is ease of use. Powdered contouring is harder than cream contours, so it is pretty average as far as that goes. And because it is pretty pigmented if you don't know what you are doing it can be tricky to work with. If you are beginner I recommend a Sculpt/Light in a Stick Duo from Tyra Beauty! Click Here to learn more about those! In the end it gets a 4.5 out of 5! The only reasons it didn't get a 5 is that I do not think it will work on ebony skin tones (and they do not make a second one for darker skin tones) and because I think the brush could be better if it were a softer angled brush. But over all this is my favorite powder contour palette and I highly recommend it.